Artist unknown. (But possibly Vince Colletta had a hand in the art.) 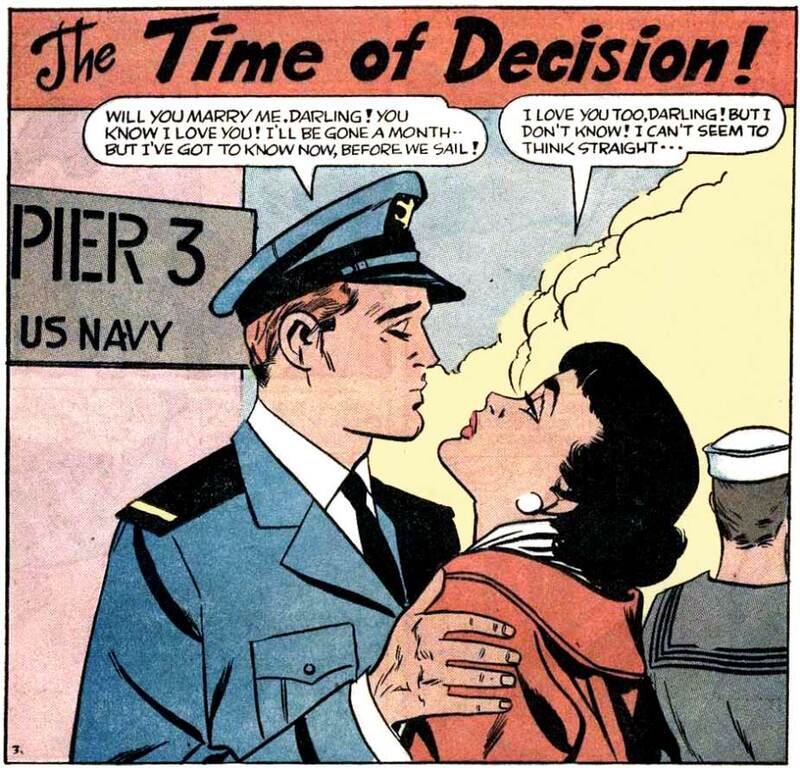 From the story “The Time of Decision” from BRIDES IN LOVE #9, 1958. SCENE: Pilot embracing a woman. PILOT: Welcome to First Class! WOMAN: I’ll never fly coach again! WOMAN: I'll never fly coach again! She’s can’t think straight because she suspects he’s not fully human. Notice the mechanical hand and lack of lips. Can’t thing straight because she still has a girl friend from college. I like how he’s been promoted over the years. I’m glad you noticed. The original uniform was for the Navy and that’s the way Diego re-drew it for the Last Kiss version. When I realized that I was going to do a gag involving a commercial pilot, I went in and did my best to make him look more like a commercial pilot. Not perfect, but close—I think.